The Charles Memorial Home is the most recent of 6 care institutions to benefit from a renewable energy gift from Grenlec. The 32-panel, 10 kW rooftop Solar Photovoltaic (Solar PV) system, which was handed over to the Charles Memorial Home will help offset the institution’s electricity costs. 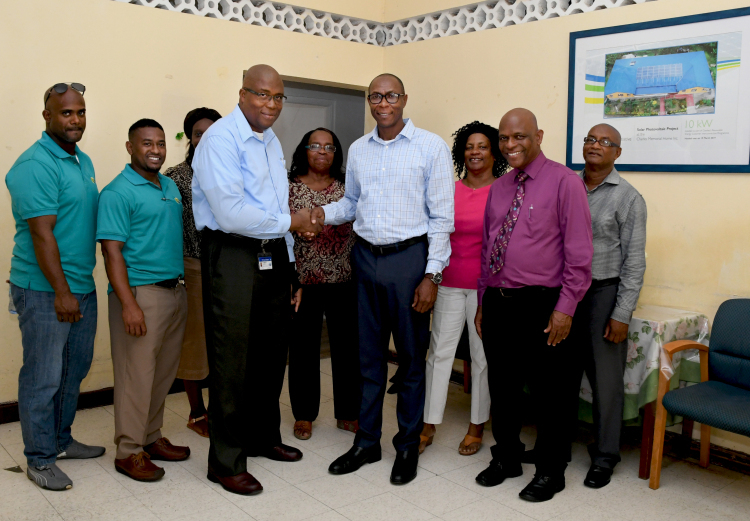 Thanking Grenlec for the project, Kester Cyrus, Chairman of the Board at the Charles Memorial Home said, “Grenlec has been a very good partner to the home over the years”. Norbert Courtney, Manager of the Home, also expressed his gratitude for the assistance that will help the Home reduce its electricity bill. The 5 other care institutions that have already benefitted from the project are: the Dorothy Hopkin Centre, the Hill View Home for the Aged, the Bel Air Home for Children and Adolescents, the Grand Anse Gardens Home for the Aged and the Queen Elizabeth Home. All of the care Institutions own the solar systems and are interconnected to Grenlec’s electrical grid and Grenlec buys the electricity generated by the systems.